Who can say no to a hearty salad on a hot day? Something refreshing and cooling, but also hefty enough to stop us raiding the refrigerator an hour later is just about the holy grail of salads. Who, then, could say no to a salad that can do all that, but also be served in cold weather? This, my friends, is just that salad. Served with cooled beets and chilled yogurt dressing when the sun is high and the air is thick, or on cooler days, with warm beets just wilting the fresh spinach and a room-temp dressing tying it all together. Miracle salad? Yeah all right, we’ll claim that! Pierce the beetroots with the tip of a knife a couple of times each, and then place in the centre of a large piece of foil. Scrunch the top to create a reasonably air-tight package and bake in the oven 45 minutes to an hour, until beets are soft. Remove the beets from the oven and leave until they are cool enough to handle. When you can, slide the skin off each of the beets and cut the pointed ends off. Cut into chunks and set aside. In a medium-high frying pan, fry the haloumi until golden. In a large salad bowl or on 4 individual plates, layer the spinach and sliced green onion with the apple and half the mint leaves (chop the other half of the mint leaves very fine). 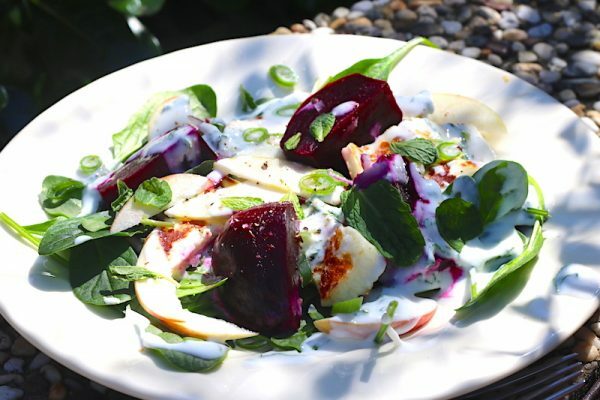 Top the salad with chunks of beetroot and haloumi. In a small bowl, whisk the yogurt, chopped mint, lemon juice, salt and pepper. Drizzle the dressing over the salad and top with extra mint leaves and slices of green onion.